Exceptional Mediocrity: Trump for President! 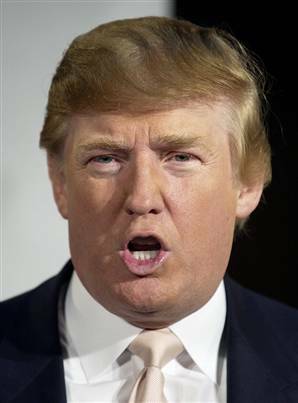 Over the past several months real-estate tycoon, television personality, and hairstyle terrorist Donald Trump has emerged as a GOP frontrunner in the 2012 presidential race. I can honestly say that a year ago that sentence would have seemed as unlikely as Mel Gibson starring in a major motion picture drama where he spoke exclusively through a child’s hand -puppet that he finds in a dumpster, yet here I am watching a preview for The Beaver directed by Jodi Foster. At any rate, I find it interesting that the Republican ticket is currently so weak that in the midst of a devastating economic downturn they are willing to pin their hopes on a man who has made a name for himself by trademarking the term “You’re fired!” Most of his recent publicity has come from reviving the outcry over Obama’s birth certificate, one of the most asinine political issues I have ever heard since investigation after investigation by various news organizations, political action groups, and official documents have affirmed the president’s status as an American citizen. I fully understand why people disagree with Obama's leadership and policies, but is it logical that a polarizing political figure with such wealthy enemies would be allowed to ascend to the most powerful position on earth before someone played that ace if it existed? What Trump wants is someone to come forward with a Polaroid of Obama being christened by Osama Bin Laden at a United States flag burning cookout. All I am saying is that Trump’s obsession with a pure American pedigree is ironic considering he is currently married to a Yugoslavian woman. In 2000, Trump made waves when he waded into presidential politics by considering running as a third party candidate. At the time, he touted himself as a supporter of universal healthcare and proposed a one-time 14% tax on the estates and trusts of the wealthy in order to alleviate some of the nation debt. Today, he wants to repeal the health care reforms and has decided that a tax on the wealthy is a terrible idea. He registered as a Democrat in 2001 and a Republican in 2009. He has publicly criticized both George W. Bush and Obama’s handling of foreign policy. He contributed to the presidential campaigns of both George W. Bush and John Kerry. He even publicly refers to the Chinese as “mother****s” for stealing American jobs yet all of his Trump menswear is manufactured there. In the 1980’s he invested in the USFL (United States Football League) by becoming the owner of the New Jersey Generals, because the only thing worse than investing the USFL was deciding to do so by way of New Jersey. From 1989-1992 he owned and operated Trump Airlines, which was never able to turn a profit and soon was repossessed by Citicorp. In 1991 his business filed for bankruptcy due primarily to issues with financing of the Trump Taj Mahal Casino in Atlantic City. In 1992, The Trump Plaza Hotel filed for bankruptcy after being unable to make loan payments. In 1995 he combined all of his struggling hotels and casinos into a publicly-held company called Trump Hotels & Casino Resorts. In 2005, the company filed for bankruptcy and changed its name to Trump Entertainment Resorts. In 2009, Trump Entertainment Resorts filed for bankruptcy again. While his has worked hard to associate his name with extreme wealth and prestige, the truth is that he doesn’t even make the list of the top 150 richest Americans. Those ahead of him include Bruce Halle, owner of Discount Tire, and James Leprino whose company is the world’s leading distributor of mozzarella cheese. Still, making the top 200 richest Americans is no small feat so exactly where does his wealth come from? It appears that the key to his financial success relies heavily on the fact that people already assume he is financially successful. According to Forbes, the most lucrative part of his fortune is the licensing of his name to real estate projects he has nothing to do with. There are currently 33 major development projects worldwide that are paying heavily to use Trump’s name and/or likeness on their buildings and this licensing makes up $562 million of his entire net worth. To be fair, while he has certainly made some financial missteps, you have to give the guy credit for marketing his name so cleverly that he can bring a half a billion dollars by trading on his perceived success. It must be pointed out, however, that the portion of the empire that licenses the Trump name is run exclusively by his children. This suggests that the less Donald has to do with something, the more successful it becomes; meaning that if he were to move to Canada and renounce his American citizenship the recession would probably immediately end and Fox would put Arrested Development back on the air. Maybe Lary King could run as Vice President ! That way a reporter will never be able to ask a question - neither man would ever stop talking !